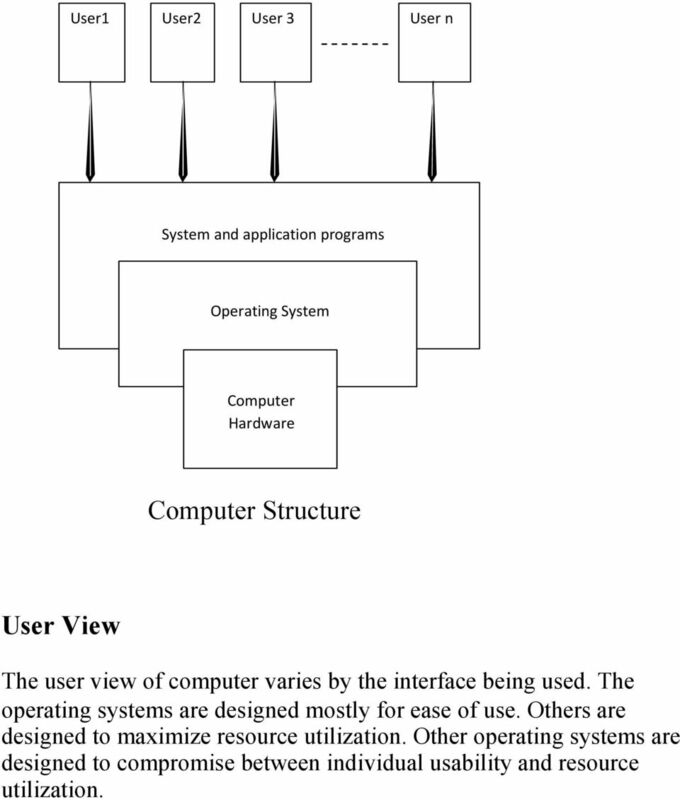 Download "Operating Systems 4 th Class"
5 User1 User2 User 3 User n System and application programs Operating System Computer Hardware Computer Structure User View The user view of computer varies by the interface being used. The operating systems are designed mostly for ease of use. Others are designed to maximize resource utilization. Other operating systems are designed to compromise between individual usability and resource utilization. 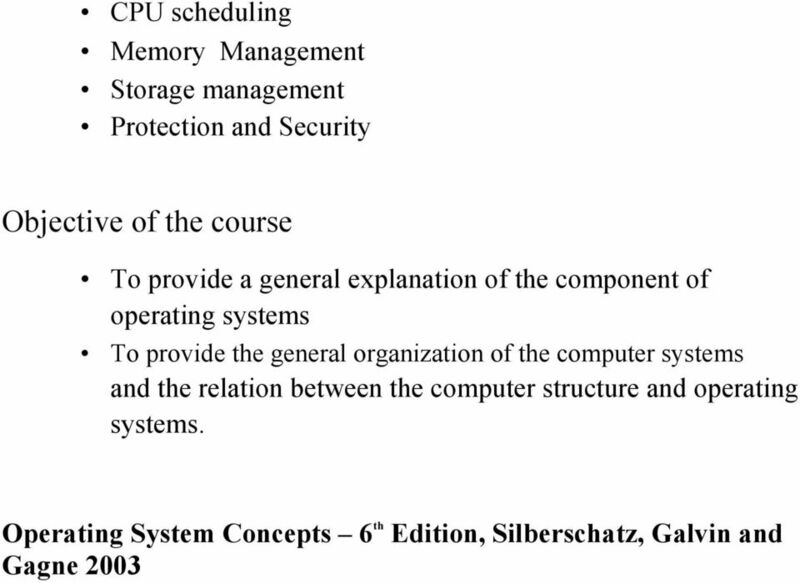 7 Lecture 2 Operating System Historical Review Operating systems and computer architecture have influenced each other. 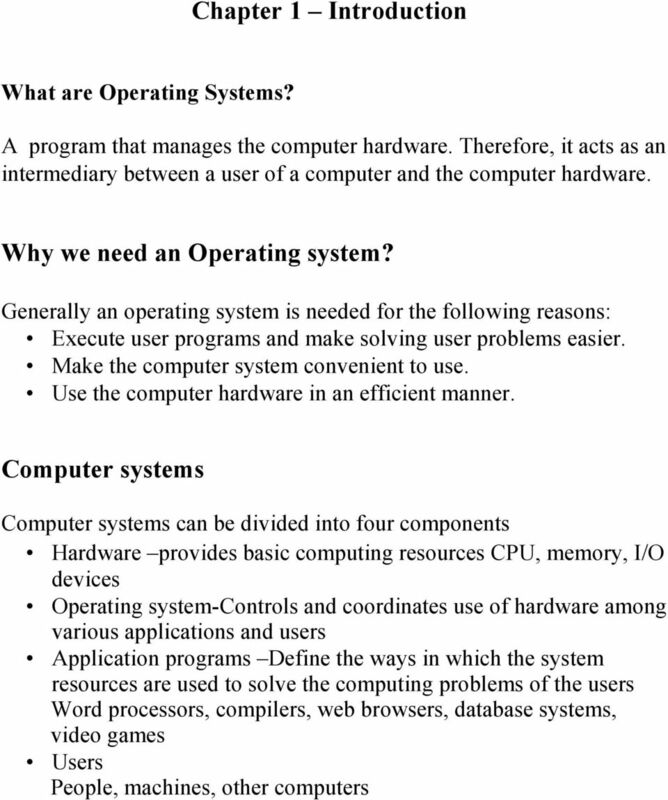 To facilitate the use of the hardware, researchers developed operating systems. In the following historical review, we will notice the mutual effect between operating systems and computer hardware which led to developments in both sides. Mainframe systems Mainframe systems grow on three stages: Batch systems In this type of computer systems, the operator batch together jobs with similar needs and ran through the computer as group. The operating system was simple and its major task was to transfer control automatically from one job to the next. Multiprogrammed systems The operating system keeps several jobs in memory simultaneously. 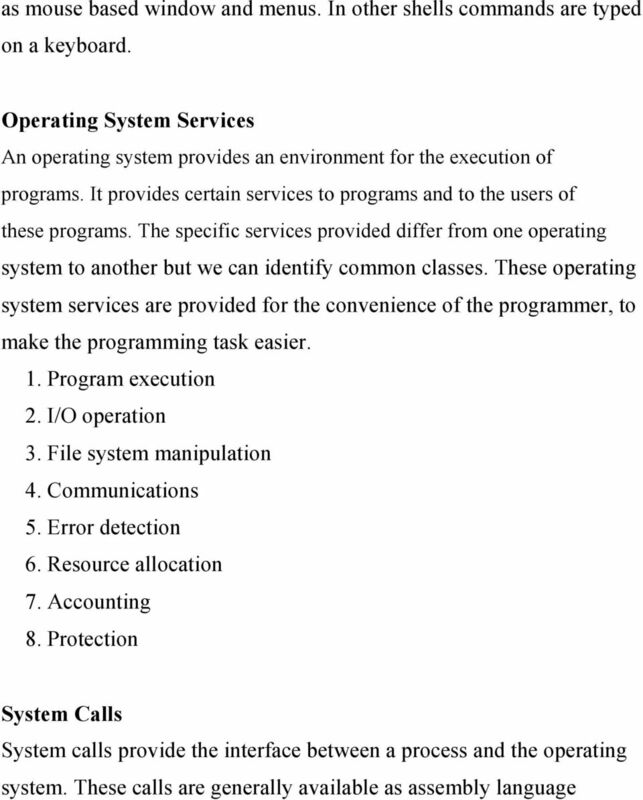 Operating systems for the Multiprogrammed is the first one which make a decision for the users. Making this decision is called job scheduling. 9 1- Increase throughput. 2- Economy of scale. 3- Increased reliability. 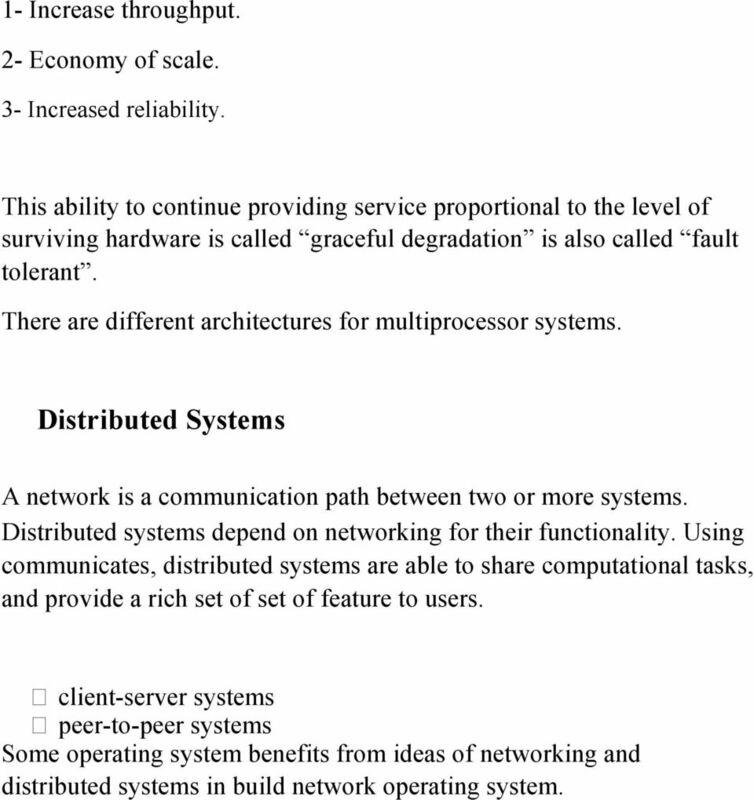 This ability to continue providing service proportional to the level of surviving hardware is called graceful degradation is also called fault tolerant. 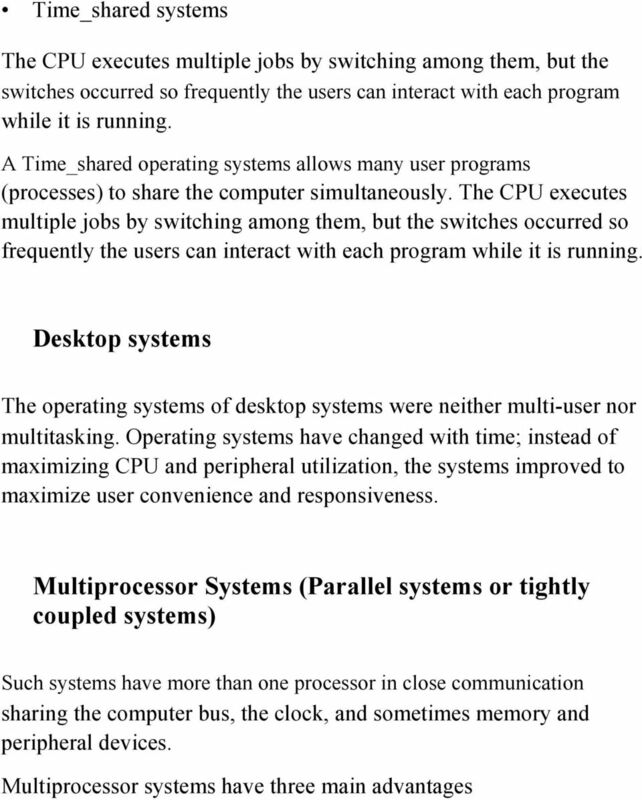 There are different architectures for multiprocessor systems. Distributed Systems A network is a communication path between two or more systems. Distributed systems depend on networking for their functionality. Using communicates, distributed systems are able to share computational tasks, and provide a rich set of set of feature to users. client-server systems peer-to-peer systems Some operating system benefits from ideas of networking and distributed systems in build network operating system. 10 Clustered Systems Like parallel systems, clustered systems gather together multiple CPUs to accomplish computational work, they composed of two or more individual systems coupled together. The general accepted definition is that clustered computers share storage and is closely linked via LAN networking. Clustering is usually performed to provide high availability. 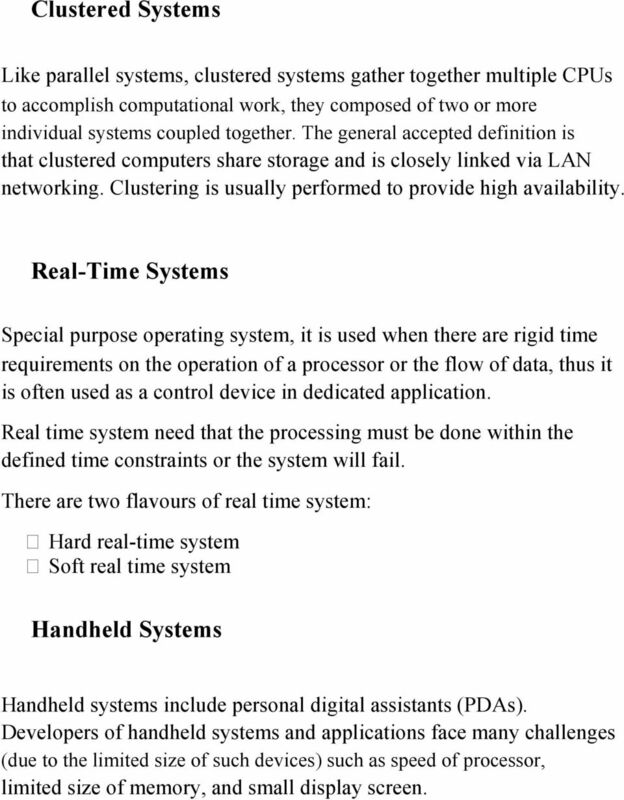 Real-Time Systems Special purpose operating system, it is used when there are rigid time requirements on the operation of a processor or the flow of data, thus it is often used as a control device in dedicated application. Real time system need that the processing must be done within the defined time constraints or the system will fail. There are two flavours of real time system: Hard real-time system Soft real time system Handheld Systems Handheld systems include personal digital assistants (PDAs). Developers of handheld systems and applications face many challenges (due to the limited size of such devices) such as speed of processor, limited size of memory, and small display screen. 11 Computing Environments All above systems are used in verity of computing environments settings. Traditional Computing. Wed-Based computing. Embedded Computing. 12 Computer System Operation: Lecture 3 Computer System Structures A modern, general purpose computer system consists of CPU and a number of device controllers that connected through a common bus that provides access to shared memory system, CPU other devices can execute concurrently competing for memory cycles. Booting: It is the operation of bringing operating system kernel from the secondary storage and put it in main storage to execute it in CPU. There is a program bootstrap which is performing this operation when computer is powered up or rebooted. Bootstrap software: it is an initial program and simple it is stored in read only memory (ROM) such as firmware or EEPROM within the computer hardware. Jobs of Bootstrap program: 1 Initialize all the aspect of the system, from CPU registers to device controllers to memory contents. 2 Locate and load the operating system kernel into memory then the operating system starts executing the first process, such as init and waits for some event to occur. 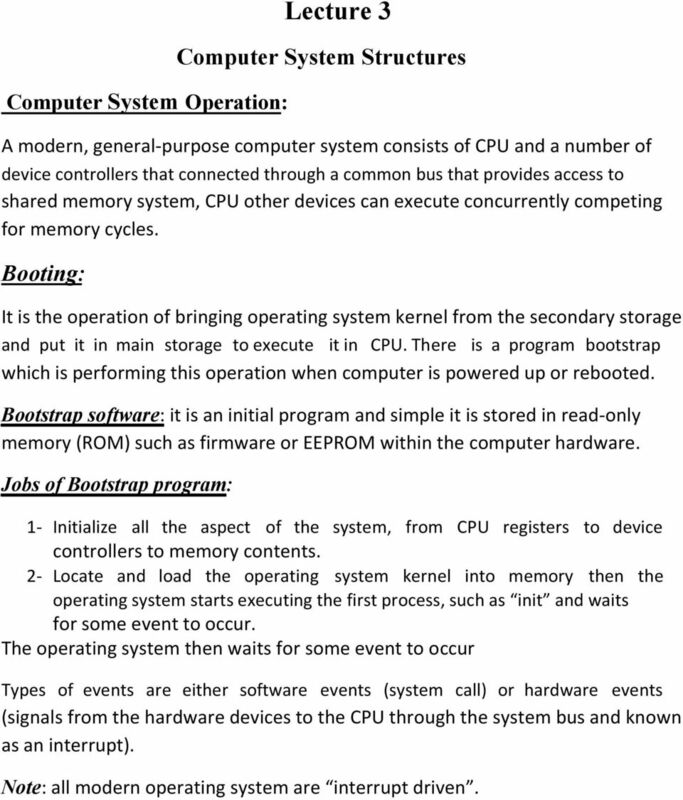 The operating system then waits for some event to occur Types of events are either software events (system call) or hardware events (signals from the hardware devices to the CPU through the system bus and known as an interrupt). Note: all modern operating system are interrupt driven. 13 Trap (exception): it is a software generated interrupt caused either by an error (ex: division by zero or invalid memory access) or by a specific request from a user program that an operating system service be performed. 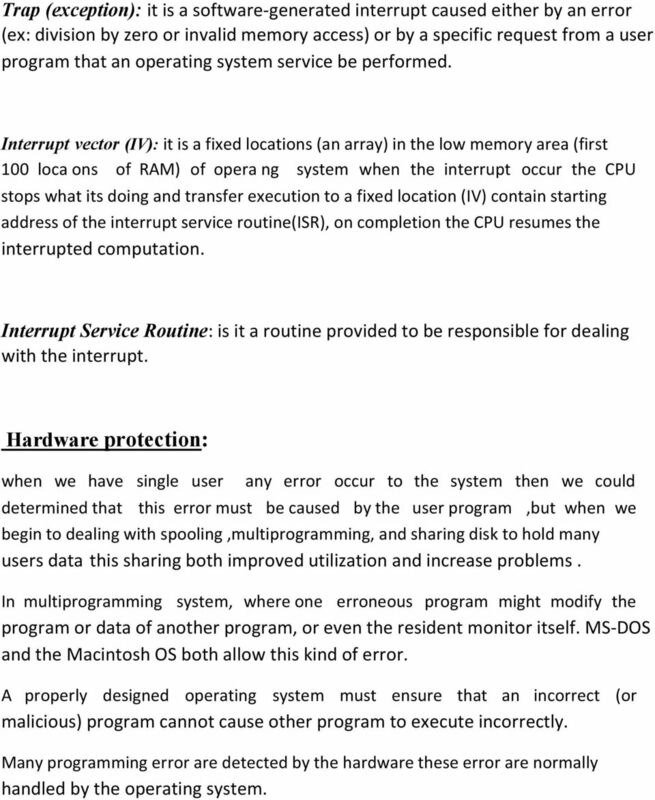 Interrupt vector (IV): it is a fixed locations (an array) in the low memory area (first 100 loca ons of RAM) of opera ng system when the interrupt occur the CPU stops what its doing and transfer execution to a fixed location (IV) contain starting address of the interrupt service routine(isr), on completion the CPU resumes the interrupted computation. Interrupt Service Routine: is it a routine provided to be responsible for dealing with the interrupt. Hardware protection: when we have single user any error occur to the system then we could determined that this error must be caused by the user program,but when we begin to dealing with spooling,multiprogramming, and sharing disk to hold many users data this sharing both improved utilization and increase problems. In multiprogramming system, where one erroneous program might modify the program or data of another program, or even the resident monitor itself. MS DOS and the Macintosh OS both allow this kind of error. A properly designed operating system must ensure that an incorrect (or malicious) program cannot cause other program to execute incorrectly. Many programming error are detected by the hardware these error are normally handled by the operating system. 15 Base register hold the smallest legal physical memory address. Limit register: contains the size of the range. This protection is accomplished by the CPU hardware comparing every address generated in user mode with the registers. Any attempt by a program executing in user mode to access monitor memory or other users memory results in a trap to the monitor, which treats the attempts as a fatal error. 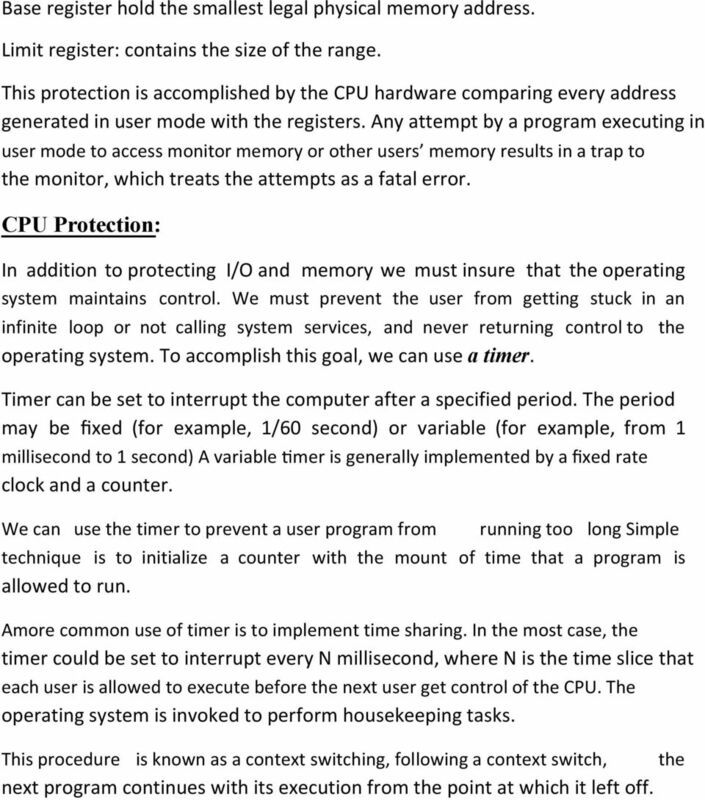 CPU Protection: In addition to protecting I/O and memory we must insure that the operating system maintains control. We must prevent the user from getting stuck in an infinite loop or not calling system services, and never returning control to the operating system. To accomplish this goal, we can use a timer. Timer can be set to interrupt the computer after a specified period. The period may be fixed (for example, 1/60 second) or variable (for example, from 1 millisecond to 1 second) A variable mer is generally implemented by a fixed rate clock and a counter. We can use the timer to prevent a user program from running too long Simple technique is to initialize a counter with the mount of time that a program is allowed to run. Amore common use of timer is to implement time sharing. In the most case, the timer could be set to interrupt every N millisecond, where N is the time slice that each user is allowed to execute before the next user get control of the CPU. The operating system is invoked to perform housekeeping tasks. This procedure is known as a context switching, following a context switch, the next program continues with its execution from the point at which it left off. 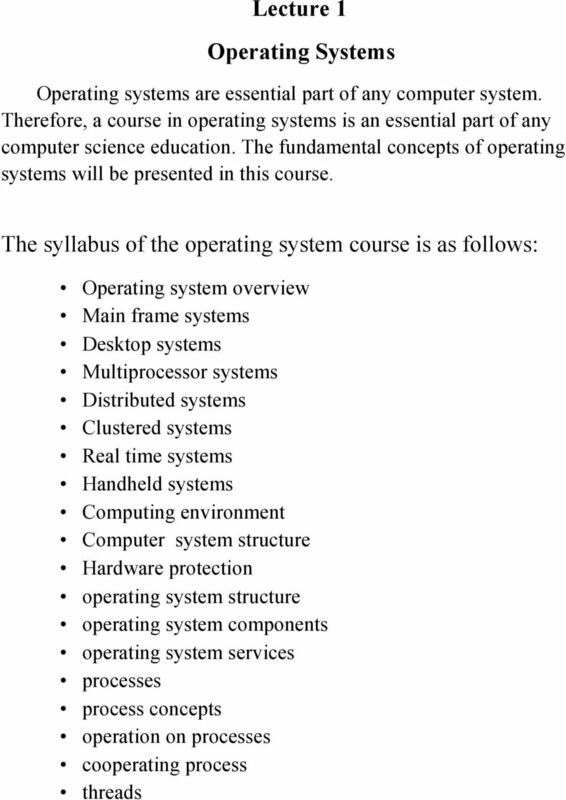 16 Lecture 4 Operating System Structure In the following lectures we will consider the components and services that are provided by different operating systems. 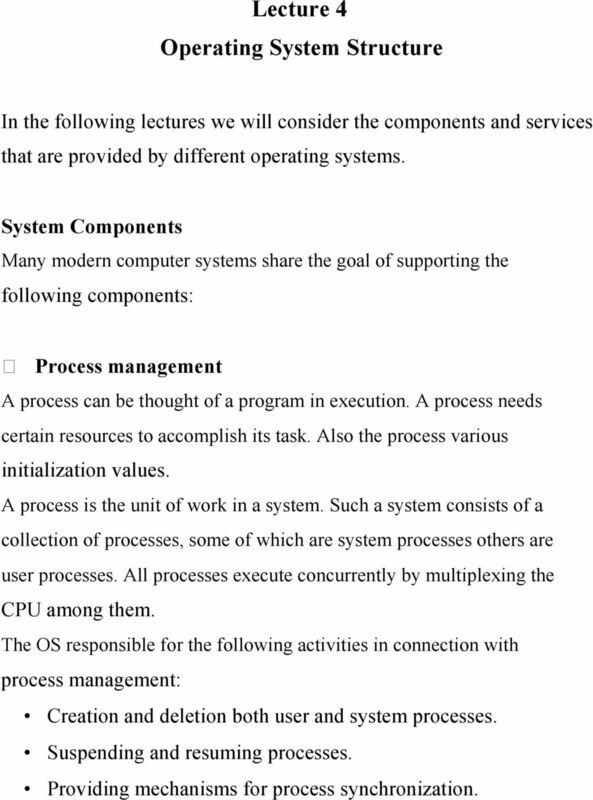 System Components Many modern computer systems share the goal of supporting the following components: Process management A process can be thought of a program in execution. A process needs certain resources to accomplish its task. Also the process various initialization values. A process is the unit of work in a system. Such a system consists of a collection of processes, some of which are system processes others are user processes. All processes execute concurrently by multiplexing the CPU among them. The OS responsible for the following activities in connection with process management: Creation and deletion both user and system processes. Suspending and resuming processes. Providing mechanisms for process synchronization. 17 Providing mechanisms for process communication. Providing mechanisms for deadlock handling. Main Memory Management The main memory is the central to the operation of a modern computer system. For a program to be executed it must mapped to absolute addresses and loaded to the MM. 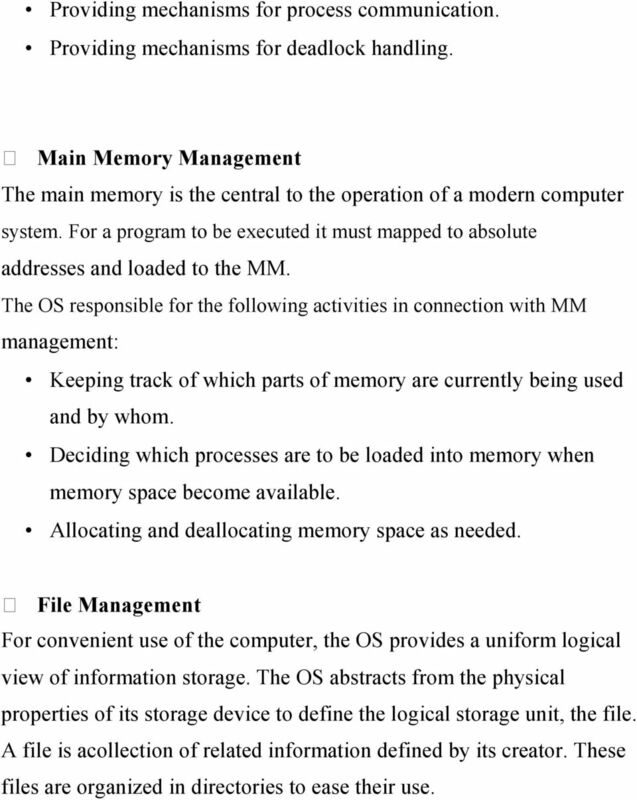 The OS responsible for the following activities in connection with MM management: Keeping track of which parts of memory are currently being used and by whom. Deciding which processes are to be loaded into memory when memory space become available. Allocating and deallocating memory space as needed. File Management For convenient use of the computer, the OS provides a uniform logical view of information storage. The OS abstracts from the physical properties of its storage device to define the logical storage unit, the file. A file is acollection of related information defined by its creator. These files are organized in directories to ease their use.